and on others icy cold. They say every dog has his day. Unfortunately, some months just don’t have as many “dog days” to offer as others. As for this ole dog, if I were making the calendar it would have two Aprils and two Octobers. To make up for this monthly double dipping, I’d do away with both December and March. Doing away with these marginal fishing months would maximize my fishing opportunities and eliminate that birthday thing I’ve been trying to ignore in recent years anyway! Twice as many days in April would allow me the opportunity to get my fill of walleye action on the Detroit River, spring run browns at Manistee, coho salmon in St. Joe and even a few strokes on Great Lakes pike. If October were 60 days long, I’d be catching more steelhead off the pier at Frankfort, pounding the jumbo perch in Lake Erie, putting a personal best Lake St. Clair muskie in the boat and patterning those trophy Saginaw Bay walleye. I know in my angling heart the marginal months of December and March wouldn’t even be missed. For those like me who live to fish, I just about guarantee I’d have support for such a ridiculous idea. Perhaps we can get our state government to consider my proposal? The fishing opportunities in December may not compare to other months, but the action doesn’t grind to a complete stop. The Great Lakes State can conjure up some exceptional fishing days even in the month of December when conditions cooperate. Much of what December has to offer anglers boils down to weather conditions. 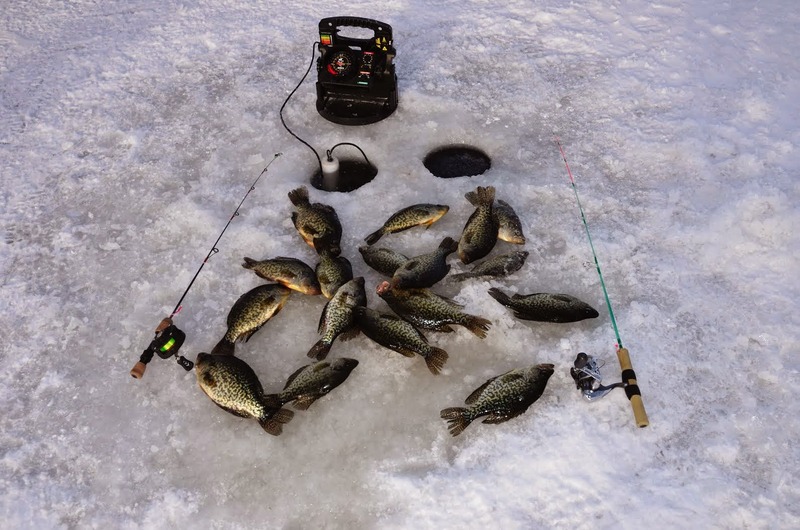 If the weather goes cold across the northern part of the state, safe ice in December can spell some amazing opportunities for bluegill, perch, crappie, walleye and pike. Jay’s Sporting Goods in Clare are a daily deal. 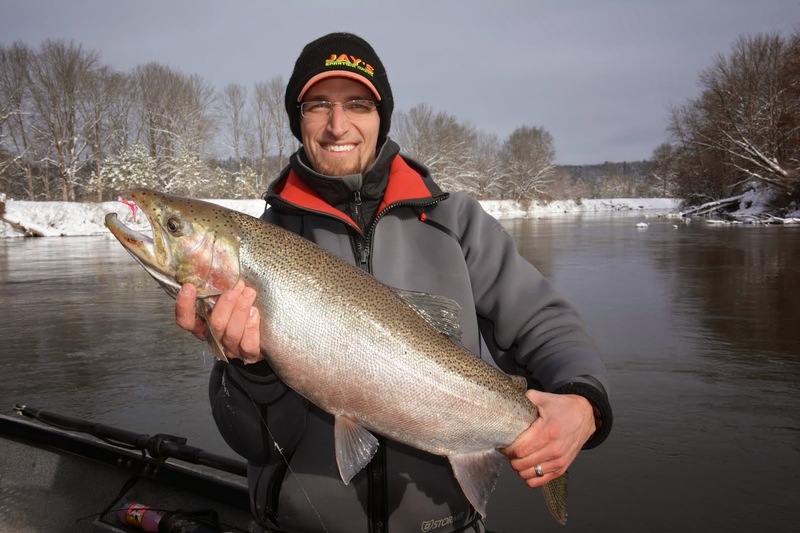 If the weather remains mild, open water fishing for steelhead along Great Lakes piers and also on select streams like the St. Joe, Muskegon and Manistee can be exceptional. On some years the Saginaw River literally fills up with eater sized walleye that bite a jig and minnow combination with reckless abandon. Perch fishing can also be dynamite on Muskegon Lake and other drowned river mouth lakes along the west coast. 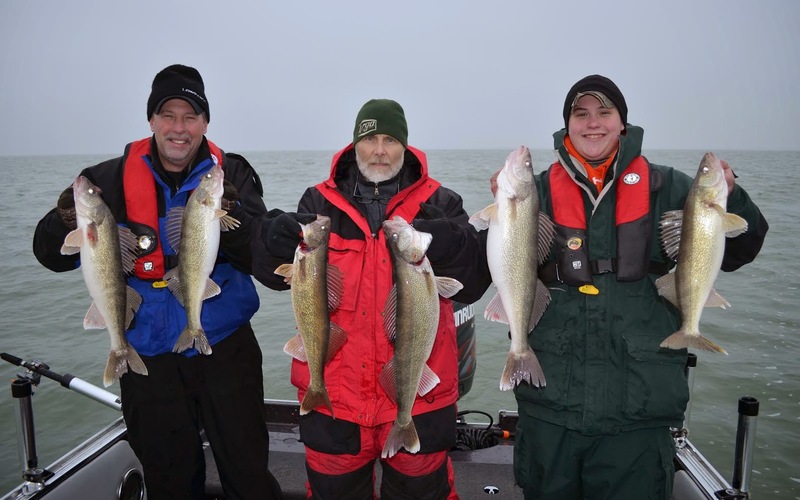 Lake Erie’s walleye will also bite well as long as the weather allows anglers to get on the water. That’s the good news. The worst thing that can happen to December is for the weather to get cold enough to make shelf ice, but not cold enough to lock in local lakes with a safe platform of ice. Cold nights and days that warm above freezing can make December fishing opportunities a scarce commodity. Ice forming at boat launches and on Great Lakes piers shuts down fishing opportunities almost as quickly as if the season closed. In general, the southern part of the state provides the most consistent December fishing opportunities because the weather is usually on the mild side. December fishing opportunities in the Northern Lower Peninsula and Upper Peninsula can be very hard to predict. anglers can expect to enjoy some fast action for slab crappie. Because the weather dictates what will or won’t happen on the Great Lakes and connecting waters during December, anglers have little choice but to hope for the best and plan for the worst. If the weather cooperates, take these final days of 2014 to get outdoors and enjoy what the Great Lakes have to offer. If the weather goes sour, anglers can still find ways to be productive. How about replacing that burned out taillight on your boat trailer? Now would also be a good time to fix or replace worn gear you’ll need when the weather breaks. Check and see if your flare kit and fire extinguisher are within their working operational dates. Chances are you haven’t thought about these details lately. Take an evening and put fresh line on your ice fishing rods and while you’re at it, get a jump on spring and put fresh line on your other reels as well. If you run short on line, isn’t December the best time to add a needed item or two on that X-Mas wish list? You don’t have to be a kid to write a letter to Santa. December might also be a good time to organize those fishing pictures that have been in your camera all summer. Who knows, maybe those fish from that Saginaw Bay trip got bigger? December may not be the best fishing month for Great Lakes anglers, but it has its moments. The best advice I can give is watch the weather closely and be prepared to go fishing at a moments notice. Since no one can predict December weather, who knows when that dog will finally have its day?